Marinate chicken (works best with chicken thighs) overnight. Grill on medium high till juices run clear. 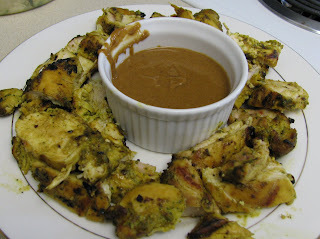 I pretty much used Ellie Kriger's peanut sauce recipe. But, next time I'm going to adjust the amount of peanut butter that goes into it.